I’m obsessed with cake right now. As such, I would be sunk without this seminal book that you probably already own or have heard about. My gratitude runneth over that just as I needed to explore its wisdom, Green Apple Books had one copy in the used section. Score! If you’ve ever wondered how ingredients work in baking, Shirley Corriher brings her background in chemistry into a very insightful and well-laid out book. 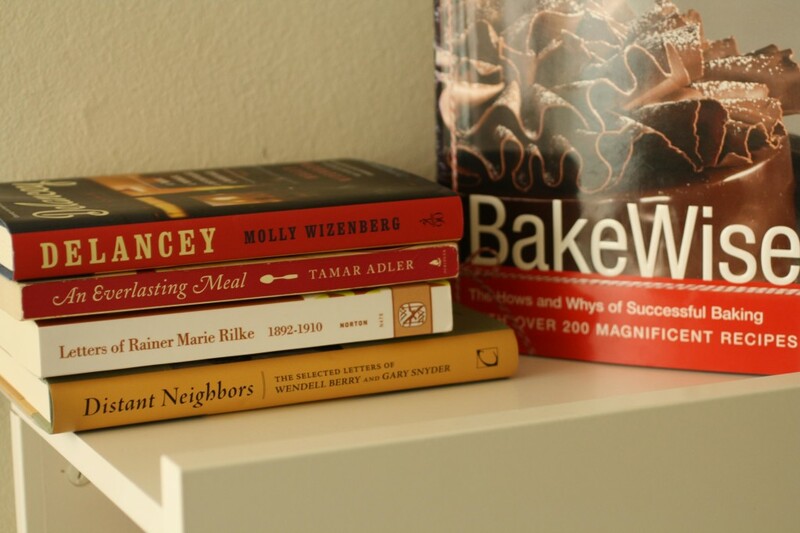 Bakewise will make you wiser in the kitchen. Chasing a rabbit can lead to parts unknown. I stumbled across a Gary Snyder poem that delighted me and ended up finding out about his new book of letters to and from Wendell Berry called Distant Neighbors. 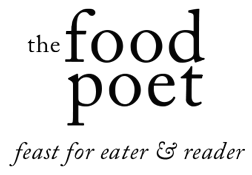 Two prolific poets and writers swap details about their similar but far apart livelihoods in this new book from Counterpoint Press. While I am still poring over the introduction, it already is a beloved book of mine. Snagging an autographed copy from both authors makes me exultant. On the topic of letters, I also picked up the Letters of Rainer Maria Rilke: 1892-1910. Rilke has long been one of my favorite poets- the spine is falling out from the translation by Stephen Mitchell of his Collected Works- it is the book that accompanied me to Paris the last time I visited that fair city. “Requiem for a Friend” haunted me as I wound my way through the Tuileries, Place Saint-Germain and on. While “Letters to a Young Poet” did not necessarily stir within me great attachment, I am keen to read more of what Rilke was thinking about, what he wrestled with and see more of a candid response than in the measured form of poetry. As much as I have enjoyed working in restaurants and in the foodservice / hospitality business, the idea of opening my own bakery or restaurant gives me palpitations. It is hard work to keep things running smoothly and can be rough goings on the way to profitability. Molly Wizenberg’s writing has always endeared me to her, so when I learned that she had written a book, Delancey: A Man, A Woman, A Restaurant, A Marriage, about starting the pizza restaurant of the same name, with her husband, I knew I needed to read this and see how she wound her way through that labyrinth mostly unscathed, still happily married and serving what I hear are excellent pizzas. I expect her trademark humor and grace to be stamped on each page. Call me a late bloomer (in some ways, very much), but when my friend Pam mentioned she had just finished a book she thought I would love called, An Everlasting Meal by Tamar Adler, I agreed that it is a book I have long wanted to check out. Five days later, a manila package promptly arrived. This is a book that will get packed in my bicycle basket for an afternoon lolling in the park reading (is there anything better?!) with me when the sun decides to pay us a visit.